Mount your DSLR, mirrorless, cine, or ENG camera using this complete CX2 Head and 75 Sprinter II Carbon Fiber Tripod with Mid-Level Spreader and Case system from Miller for your studio or field video production. The system includes a CX2 fluid head, a fixed-length pan handle, a 75 Sprinter II carbon fiber tripod, a mid-level spreader, a set of three rubber feet, and a soft carry case. The CX2 fluid head features counterbalance settings, a side-load plate, and a maximum payload of 17.6 lb. The 75 Sprinter II carbon fiber tripod supports a maximum payload of up to 66.1 lb, features a 75mm bowl head and spiked feet, supports a mid-level spreader, and has a built-in carry handle. Read more below about the items in this kit. The Miller CX2 Fluid Head is designed to accommodate a wide payload range with 16 steps of counterbalance. Pan, tilt, and counterbalance can all be set to zero, enabling even the lightest of cameras to be supported. Maxed out, this head is rated to support camera setups up to 17.6 pounds, adequate for a rigged up DSLR or mirrorless camera, a smaller cinema camera, or a small ENG camcorder. Securing your camera or rig is easy. The sideload plate design enables you to simply drop in your camera without the alignment issues posed by rear-loading variations. The plate offers 2.4" of sliding range to balance your rig. To survive fast-paced shooting environments, the CX2 is die-cast from a lightweight, yet durable metal alloy with composite polymers and precision ball-bearings for smooth mechanical operation. Even in harsh conditions, the CX2 will perform reliably. The base of the CX2 is a 75mm ball for mounting to compatible tripods and grip equipment. An illuminated bubble level makes it easy to level the CX2 in dark environments. A fixed length pan handle is included, and a second rosette is available for attaching an optional second pan handle. The Miller 75 Sprinter II 2-Stage Carbon Fiber Tripod is a quick-setup solution for a tripod head with 75mm ball base. Its lightweight, dual-action flip locks and rigid carbon fiber construction allow for durability without compromising usability in ENG, EFP, and other pro video applications. Unlike many traditional multistage designs, both flip locks are located on the same section for easy reaching, no matter the height setting. The feet have integrated steel spikes to add stability on rough or uneven terrain. The fast setup is complemented by an in-line carry handle for portability on set or in the field. Compatible mid-level spreaders, rubber feet, and dollies are available separately. 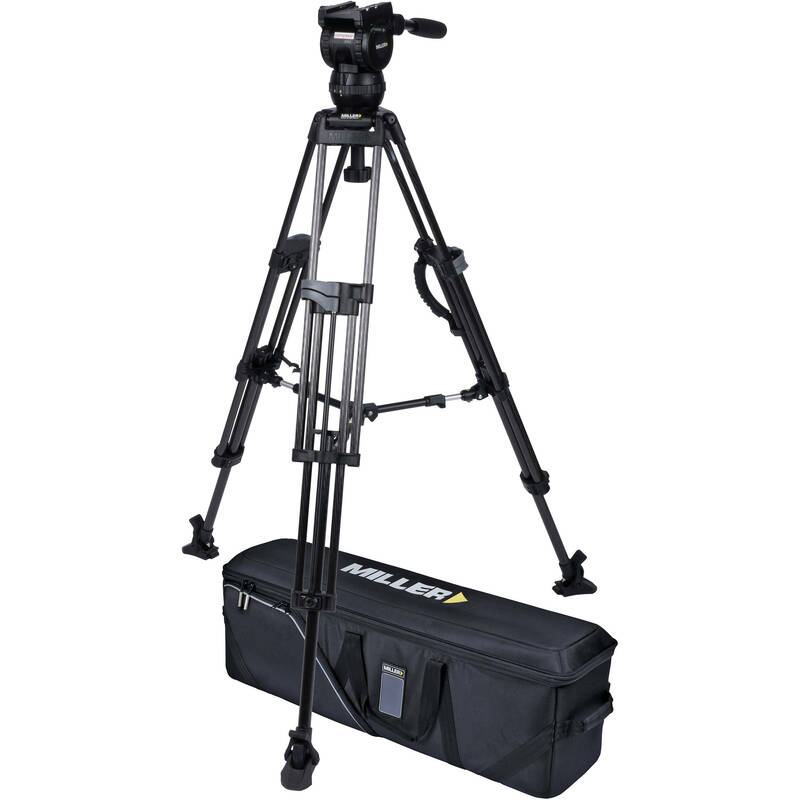 Height extends from 23.6 to 60.4"
The 475 Tripod Feet from Miller are a set of three rubber snap-on feet designed to be used in any situation where the integrated dual spiked feet are not optimal. They are ideal for use on both slippery and glossy floors. These rubber feet are compatible with all tripods with a 993 mid level spreader. Set up your tripod quickly and safely with this Basic Mid-Level Spreader from Miller. The spreader is compatible with 75 Sprinter II tripods and easily latches onto the tripod legs. The telescopic design extends from a 15.8 to a 25" diameter and allows users to set the tripod leg angle for rapid setup. The durable aluminum spreader helps to stabilize the entire camera system, and its arms are secured with locking latches. The Miller Pan Handle for Compass15 and Compass20 Fluid Heads is a 16mm fixed-length pan arm. The main tube is black-anodized aluminum alloy and features a comfortable rubber grip. Store, transport, and protect your gear with the black Miller Arrowx softcase 2 Stage for Sprinter II and Toggle 2 Stage Tripod Systems. The case features zipper closure, top and bottom cradles with straps to secure your tripod, and back pack straps with a storage pocket. For strength and durability, the case is constructed with a ballistic nylon shell and hard plastic skid pads. Carry the case with the dual strap handles or padded grab handle. You can also attach a sold-separately shoulder strap to the case D-links. An external pocket and card holder makes case identification easier. Box Dimensions (LxWxH) 18.0 x 12.6 x 12.3"
Box Dimensions (LxWxH) 7.5 x 5.6 x 5.4"
Box Dimensions (LxWxH) 15.75 x 3.0 x 2.15"
Box Dimensions (LxWxH) 39.0 x 13.75 x 12.0"